I went to 50% off day at Goodwill with my primary shopping friend last week. 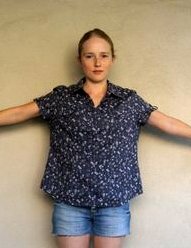 She is spending a month in Israel and needed a couple pieces of clothing to wear when visiting the orthodox neighborhoods (calf-length-or-longer skirts, shirts that covered her elbows and her collarbone). She found what she needed and I came across this shirt discarded in the pants section. It delighted me. “Um, ok…” she said when she came back to see me buttoning it over my tshirt in front of the mirror. “I think I can make it my size without any trouble. It will be a great shirt when it’s like this,” I gestured as I gathered the fabric in one hand behind my back. “…to the office! A totally reasonable thing to wear on the weekend and to the office!” I added. “Um. Well. Ok. I’m glad you like it, anyway”. Who’s wearing it to the office now?? June 14, 2012. Tags: before & after, clothes, completed project, floral, Goodwill, refashion, shopping, Target, What I Wore to Work Today. Pictures, Projects, What I Wore to Work Today, Words.